Introducing Xpert iMart, a Point of Sale and Business Management solution that boasts speed, ease of use, reliability and an extensive range of powerful features designed for an array of diverse retail verticals ensuring your business is operational at all times. 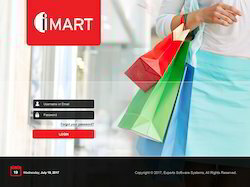 Xpert iMart Point of Sale and retail management tools ensure that you serve your customers effectively whilst maintaining tight control over business processes, performance and generates immediate cost savings. Our systems have been proved in the field for over 5 years and are continually evolving to give you a competitive edge. Transmission of financial and other information between headquarters and stores is highly automated and occurs via a secure internet site or alternatively communications via dial up or LAN connections are also available. Xpert iMart is completely modularized, allowing you to purchase a tailor made solution that meets your specific point of sale and financial management requirements. Before installing our software, we study and understand your business and business needs. This helps us in designing a solution that best meets your requirements and helps you in understanding your business more closely and using the system you invest in to the reach the best possible outcome for your business. Expert Software Systems Private Limited is the prominent Service Provider of Hotel Management Software, Software Solution,Business Management Software, Application Software Package and many more. Our company was established in 2009, in Chennai, Tamil Nadu. Our growth in the past few years is the result of our commitment towards maintaining quality. To fulfill the industrial and market needs, we always follow the best business policies to serve our customer with maximum satisfaction. We are the acknowledged service provider in this field. Our company is authorized by Ministry of corporate affairs for its excellence in providing services and products.